Plantar fascia is a thick band of a particular type of connective tissue called fascia. Some people refer to plantar fascia as a ligament because it has strong connections to the calcaneus and metatarsals; however it is a continuous web of tissue with particularly thick areas running between those bones. The plantar fascia provides structure and support to your foot as well as shock absorption with every step you take. There are many causes for restrictions to develop in the plantar fascia, often there is more than one factor contributing to your symptoms. Age- as we age we lose some elasticity in our tissues, decreasing our plantar fascia’s ability to absorb forces. Overweight/Obesity- excess weight means excess stress on your plantar fascia. On your feet all day long- professions that keep you on your feet all day (often on hard concrete floors too) increase the workload of your plantar fascia and can contribute to fasciitis. 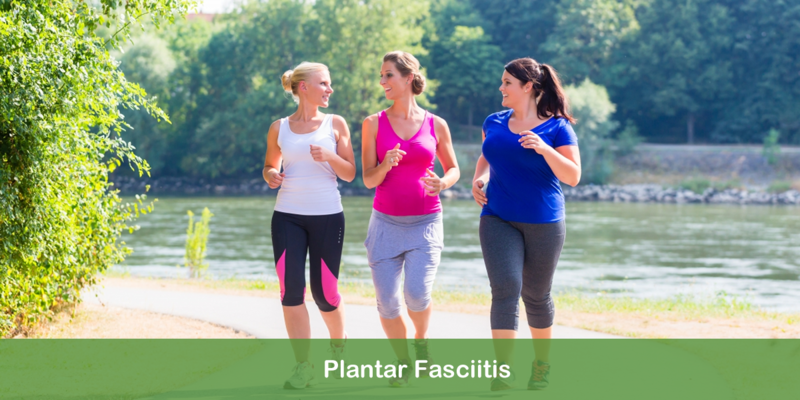 Type of Exercise- distance running and frequent high impact activity can contribute to plantar fasciitis, suddenly changing what you are doing may as well. Impaired Foot Mechanics- prolonged immobility due to casting or walking boot can cause restrictions in the fascia, surgery in the ankle/knee/hip or an injury that changes the way you are able to walk may contribute to plantar fascia pain. The addition of “itis” to a term in medicine is used to indicate inflammation, however plantar fasciitis often means more than irritation or inflammation of the fascial tissue. Plantar Fasciitis means there are adhesions/restrictions in the tissue preventing the fascia from absorbing shock/forces as it normally does and prevents it from lengthening and shortening as it needs to when you stand or walk. Often this results in pain near the heel and along the inner part of the arch of your foot. Typically this pain is worst in the morning, after prolonged sitting, after prolonged weight bearing activity (standing, walking, running). How can I Treat my Plantar Fascia Pain? At Skin to Soul, we will assess all possible contributing factors to your plantar fasciitis and treat accordingly. We specialize in Myofascial Release, a type of manual therapy proven extremely effective at releasing restrictions in the elastic and collagenous aspects of your fascial tissue. We can make recommendations for appropriate footwear to support your foot in all the activities your enjoy doing. This will entail a biomechanical foot, gait and running analysis where appropriate based on your activity. Self-treatment and preventative maintenance are key components of your care at Skin to Soul. We want to give you the tools in your toolbox to enhance our treatments at home and help prevent a recurrence. Often this entails a couple simple changes or additions to your normal stretching routine and a couple exercises to ensure you are literally putting your best foot forward.